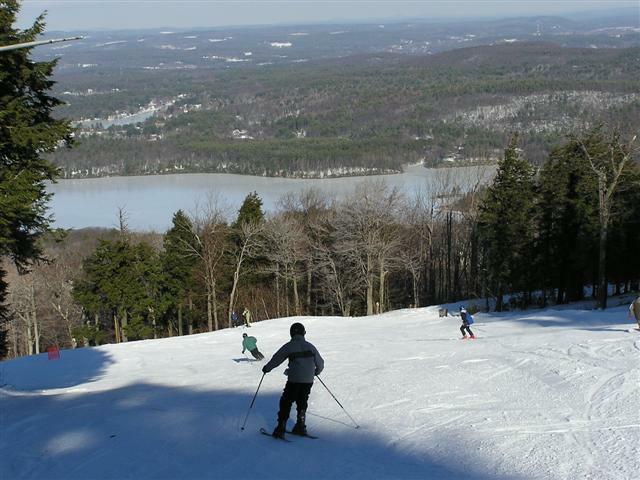 The photo shows a small part of my "office" as a ski instructor at Wachusett Mountain in north central Massachusetts. I'm a member of and certified by the Professional Ski Instructors of America. I teach in the "regular" ski school and in the Polar Kids school, for children aged 4 to 13. The two schools are quite different. Most of my Polar Kids classes are with children aged 4 to 6, and there are half a dozen classes at levels 1 and 2 for every class at a higher level. My philosophy with the little ones is to let em ski, give an occasional hint to get their hands forward or their heads up, and for God's sake don't remove the fun! Read about a typical Polar Kids class. It should be clear from that account that, at least with 4- and 5-year-old beginners, I'm not big on explanations and drills. I'm fond of saying that I teach them to ski the same way you taught them to walk. You didn't teach them to walk. You provided a safe environment while they learned to walk by themselves, not allowing them to learn near a highway or the edge of a cliff; you picked them up when they fell; you encouraged their successes and minimized their setbacks. I do that on the ski slope, offering the occasional suggestion, playing a few games to encourage turning rather than their enthusiasm for raw speed, and selecting the appropriate slope for their level. My approach gradually changes with the age of my students and with their level of ability. An adult, or even a 10-year-old, is capable of understanding why you want him to get on the edges of his skis. And even the youngest skiers, as their ability increases and the first burst of enthusiasm for a brand-new skill recedes, become more amenable to drills designed to improve some aspect of their skiing. But there's a danger in that which I have to watch out for. In skills which have to be learned hands-on, it is all but universal that the instructors themselves lament that they talk too much. One day I was fortunate to have a class which forced me to learn just how little I could say and still get the required points across. Here's the "Silent Ski Instructor" story. It's obvious that people have widely different aptitudes and interest levels, but if you're like most people, after one lesson you'll be able to practice on your own on the two beginner slopes at Wachusett. After a few hours of this, you may want to grab another lesson as a refresher, to correct bad habits that creep in, and to set the stage for more advanced turning techniques. When your improvement begins to level off, you can enjoy your capability as it is, or take another lesson to move forward some more. There are some mighty fine skiers among the instructors, and it'll be a long time before they can't help you improve. If you start at the beginning of the season, by the end of the season your progress will astound you. Come out and give skiing or boarding a try. My hours vary from day to day, so if you're looking for me specifically to run a class for you, call or email me in advance to set up a time when we're both available. Downhill isn't the only way to go. The downhill area occupies most of the north side of the mountain. The rest of the mountain is Wachusett Mountain State Reservation and has a maze of hiking trails, unpaved roads, and the paved road to the summit. My wife and dog and I often park at Echo Lake Road to ski in to Administration Road and thence to the top along the paved summit road. On our way back down I leave the road on the Semuhenna Trail to take that steep and narrow route to Balance Rock. Ellen and Duke continue around on carriage roads to meet me there, and then we wend our way back by a variety of routes.